Mahindra Scorpio Facelift Review – Price List, Mileage, Specs, Features, Design, Interior, Images & More! Read Mahindra Scorpio Facelift 2017 Review. Check New Scorpio Facelift Price Details, Images, Mileage, Features etc. Mahindra Scorpio is one of the iconic SUVs that has been the bread and butter of Mahindra for a long time. It is the first SUV that’s built for the global market. Scorpio was first launched in the year 2002, and company again reintroduced it as the ‘all-new’ Scorpio in the year 2006, while the 3rd generation model was launched in 2014. Time and again the company has been updating this SUV to give it an upmarket feel. The latest update of the Scorpio comes with a plethora of alterations inside out along with the changes in the mechanics. Let’s look what all the new avatar of Scorpio has to deliver to its customers. Scorpio facelift on the outside is as remarkable as it was earlier with masculine looks remaining intact. The front profile has been refreshed, now it’s bestowed with imposing front grille along with chrome inserts that maintains the complete attention of the onlookers. Bumper is also redesigned and the fog lamps are updated too with chrome bezel. Scorpio facelift comes with a new and refreshed skid plate and subtly tweaked projector headlamps. On the sides, car gets new OVRMs with side turn indicators which accentuate Scorpio’s bold appearance. Scorpio facelift rides on the new muscular 17 inch alloy wheels. Coming to its rear part, not much has been changed so as to keep the family feel alive. Tailgate at the back is refreshed and comes with chrome applique while its aero blade wiper grabs the attention. The car now comes with new attractive red lens LED tail lamps. So, overall Mahindra has done a decent enough job at the exteriors to make the Scorpio look more contemporary. ALSO READ: 2017 Ford EcoSport Facelift Review – Price List, Mileage, Engine, Features And More! Inside the cabin, the cosmetic changes are limited. The top variant S11 gets new dark grey faux-leather seat upholstery, elaborated with dark blue weave pattern that matches with the cabin, enhancing the ambience. The gear lever as well as steering wheel is wrapped in the same faux leather. New roof mounted sunglass holder and new mobile holder slot are also new addition. Mahindra Scorpio facelift come jam packed with many advanced features which were lacking in the previous 3rd generation model. The newly included features are reverse parking camera along with Dynamic assist so that you are always in control even while reversing the car. The visuals of reverse camera can be seen in the 6 inch touchscreen infotainment which also allows AUX, USB connectivity, Bluetooth and GPS navigation same as before. Scorpio also comes with new 1-touch lane indicator, steering mounted audio and cruise controls, electrically adjustable OVRMs, Voice assist system, Intellipark and Rain and light sensors. So, there will be no compromise on luxury and comfort. Talking about the dimensions, they are intact with the SUV measuring 4456 mm in length. The height is different in the S3 variant that measures 1930 mm while S5, S7 and S11 measures 1995 mm. Width of the SUV stands at 1820 mm, wheelbase at 2680 mm, ground clearance 180 mm and its fuel tank capacity is 60 litres. The car comes in total six variants namely S3, S5, S7, S7 120, S11 and S11 140 (4×4). No automatic transmission is available in any of the variants. The under the hood department has been updated. While the base model S3 continues to get power from 2.5 litre m2DICR mill that can generate output of 75 PS and peak torque of 200 Nm. Its S5 and S7 variants will work on the same mHawk engine as seen in the older version that is capable of producing power output of 120 bhp and torque of 280 Nm. Though its top end trims S7 and S11 retains the same 2200 cc mill but new Borg warner turbocharger has been tweaked to bump more power and torque. It now generates 140 bhp of power and yields the peak torque of 320 Nm. Lower variants continues to use the 5 speed manual gearbox while the top end variants S7 and S11 get the brand new 6-speed manual gearbox. 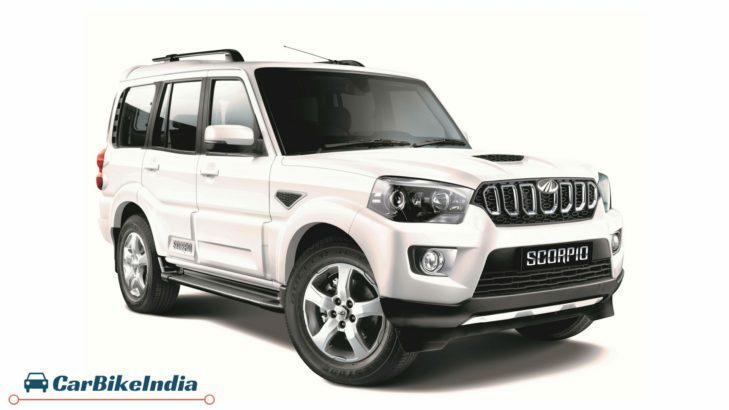 Coming to the Safety features, Mahindra Scorpio facelift comes with Dual airbags (passenger and driver), ABS, Engine immobilizer, Panic brake indication and seat belt reminder lamp. The SUV now has been beefed up with revamped brake pads and new brake boosters to instil confidence. Drivers as well as passengers safety is always at the forefront for the car maker. Other important features are Anti-theft warning, Auto door lock while driving, Collapsible steering column and side intrusion beams and speed alert. As usual, new Mahindra Scorpio will compete against Hyundai Creta, Honda BR-V and Renault Duster in the mid-sized SUV segment. Though price wise it matches the league while it also gives tough competition to Nissan Kicks SUV and Renault Captur that are priced slightly higher. New Scorpio facelift does retains the old-school like feel along that car-like driving that comes with a modern touch. But absence of automatic transmission shows that Mahindra hasn’t responded to the customer feedback yet. On the other hand introduction of powerful mHawk engine compensates the loss. It boosts the overall performance and fixes the top end grunts that the customers complaints about. Looking at the additions, Scorpio seems to be a big thumps up and continues to give a likeable feel to the ones who still loves traditional way of driving.